On December 1, we can begin marking the last days frenzied days to Christmas 2013. Most of us have one (or more) Advent calendar, and we start opening doors, finding treats, hanging ornaments or whatever we do to mark each day. At our house, we’re still using the same felt calendar that my friend Donna and I made when our boys were four or five. I have a second, more elaborate, woodland house from my sister, Barbara. In each door, tree or window, there is a small woodland creature. Last night my friend Gini showed me the best computer Advent calendar, a Jacquie Lawson Edwardian Christmas calendar. For a small fee (less than a standard Hallmark card), I purchased the animated calendar. 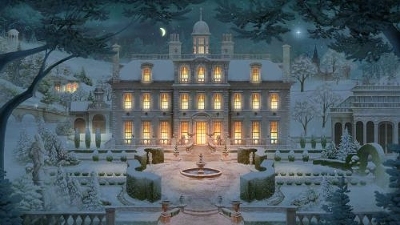 Each day, I will watch the family in an English country house prepare for their Christmas. The setting is very much like Downton Abbey, with both the upstairs and below-stairs members of the household. On December 1, we were introduced to the family dogs and cat. I looked around the house and found puzzles and games, other animated curiosities, and, in the library, numbered books that elaborated a little more on the customs of the early 1900’s. I imagine that people of all ages can enjoy something in this animated wonderland. I sent the calendar (for another small fee) to three of my friends, and I hope they enjoy it as much as I do. I was a little worried about downloading the file, but that went smoothly. One small drawback is that the calendar does not work on iPhones or iPads. The snow globe icon is on my desktop, so I’m reminded of the joys of the season while I am working! Lawson and her small team of employees work out of a village in England creating e-cards. There is a second Advent calendar, the Alpine Village, that is also available. This morning, Roger was inspecting Noah’s finger because Noah had a splinter. 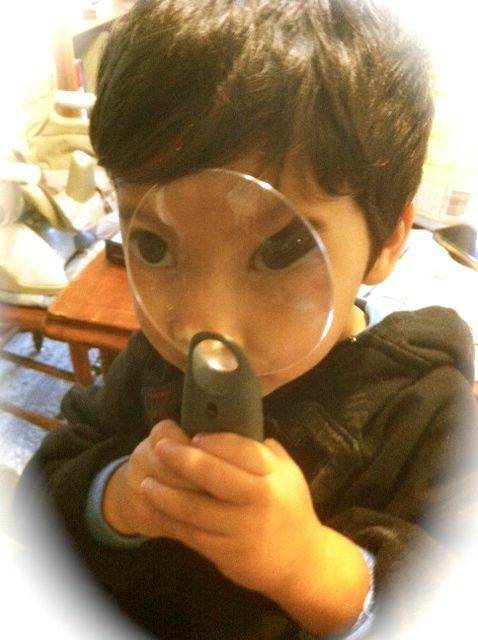 They used the big magnifying glass and had quite a time playing with it. I took a few pictures on my iPhone, and I was delighted with the one posted here, but will I remember this adorable photo in December? Maybe not. That reminded me that I already failed on my first New Year’s resolution. Every year, sometime in late November, I get geared up to make a calendar for the family, and by December 15, I’m a frustrated mess, working against the clock to get it done. Invariably, I don’t make it in time for free shipping, and I have to pay a ridiculous price for a single calendar or book. Of course, I feel I must pay the price because I can’t abandon all of the hours of work. Instead, I could set a reminder for the last day of each month. On that day, I could upload my photos to Shutterfly into the calendar I have already started. By December, I can quickly add the requisite Visit to Santa photo and–voila!—the calendar is finished. My comments here are related to Shutterfly, but I know that other companies (Snapfish, WalMart, and more) offer similar services. The beauty of Shutterfly is that the calendar dates I create, like anniversaries, birthdays, and more, can be saved and accessed for the next year’s calendar. All of the important dates for Roger’s family are already saved into a calendar I made two years ago. When I start the 2013 one, I don’t have to scrounge up the list. I can just add the new babies! Also, the online technology has developed over the years. Now, Shutterfly offers the ability to have several photos on the picture page and smaller photos on the individual dates of the calendar pages. Also, Shutterfly sends more coupons than there are advertisements for the presidential candidates. I have learned to order one photo book or calendar with a 50% off coupon and free shipping and then wait for the coupon that comes a few days later offering a second calendar or photo book at a deeper discount. So, I am re-dedicating myself to my goal. After I finish this post, I’m going to upload this photo and a few others I took in January. If you are new to calendar/photo programs, give yourself a chance. It takes a little time to learn the tools, but once you have practice, it’s easy to make beautiful gifts! P.S. I just received a Shutterfly coupon in my in-box for Valentine discounts!